TOO MUCH WATER is a common cry in watering indoor plants like Ficus benjamina, the Dracaena, Spathiphyllum (Peace Lily), Philodendrons and many other houseplants. Over-watering is probably one of the top 3 or 4 reasons plants fail to survive indoors. Overwatering plants may cause the death of house plants but there is another side of the coin… that is not watering plants or the soil thoroughly. When soil becomes saturated with water “pouring more on” makes it easy for the soil to stay wet. Roots may rot off due to wet feet but the soil media remains. What is meant by not watering thoroughly? Reducing watering of plants means attention must move to moisture in the soil. Instead of watering weekly – stop and look at the time it takes for the potting media to “dry out” to a specific level in the pot as our “watering gauge”. Plant varieties plays a part but assume for a moment that the top 1/3 of the soil in a pot needs to dry from the top down. Soil moisture still needs to be maintained. Do not forget we are not talking about soil wetness but moisture. When most people water plants they simply pour water in one spot or water at the outer edge of the pot. Think of completely watering the the entire top 1/3 of the pot. In small pots (4 inch or so) watering in one area may be OK, but in larger pots if you follow the same method you’re actually watering a smaller area by volume. Water takes the path of least resistance. Watering can work almost like a funnel. Everything moves through a path down into one spot. If the soil becomes dry it can be very difficult to ever get the soil wet again. Have you ever noticed how dry soil can actually repel water? 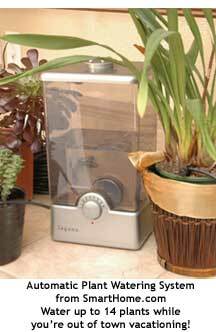 When doing any plant watering consider using a “water breaker” sort of like a shower head. This helps disperse the flow of water helps put water on the entire soil area and not one spot. Watering indoor plants or in the landscape and even the lawn is an art form. Learn to water correctly and plant care becomes much easier.